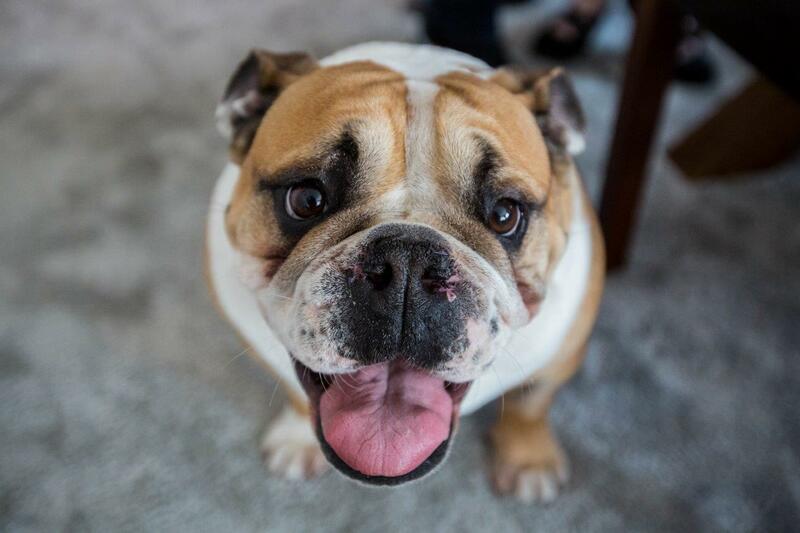 Buster lives with Rachel, her partner Kevin and their other Bulldog, Billy. Rachel is totally smitten with the breed. She describes meeting Buster as love at first sight, and has had him since a puppy. Buster is not the only one with health problems; Rachel is recovering from major bowel surgery and is waiting for a double lung transplant. 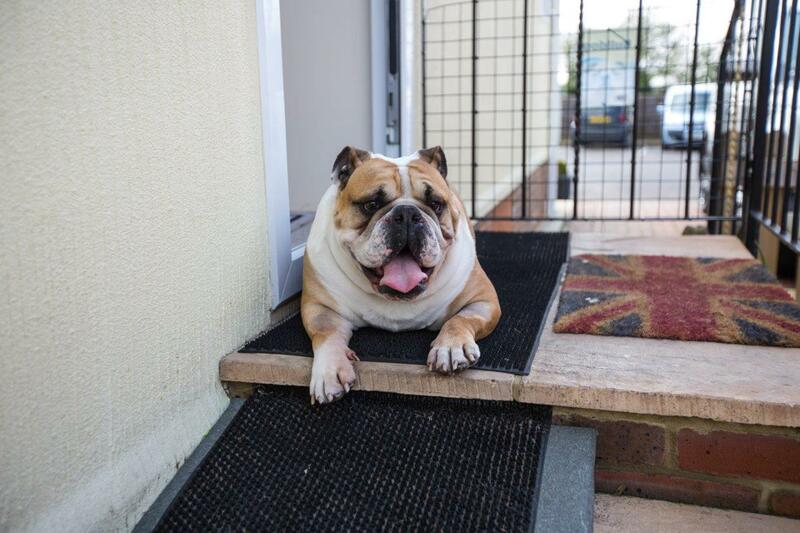 Pain in his hind legs meant that Buster was finding it hard to get around, which contributed to him becoming overweight. Unfortunately, the excess weight was making his hind leg problems even worse. 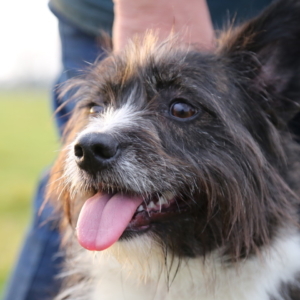 Noel explained that Buster had problems in his knees and his hips, though his knees were probably causing him the most trouble at the moment and would likely need totally replacing. 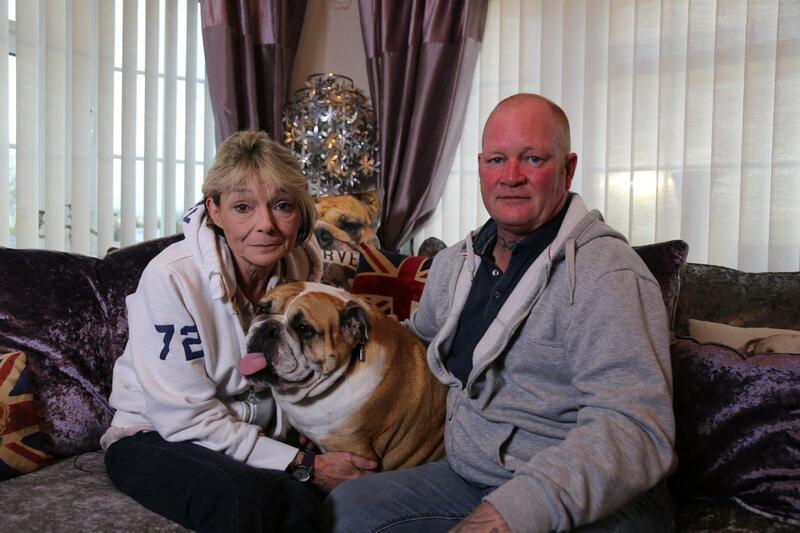 In addition to all of this, Buster was struggling to breathe, a common problem in brachycephalic (flat faced) breeds. 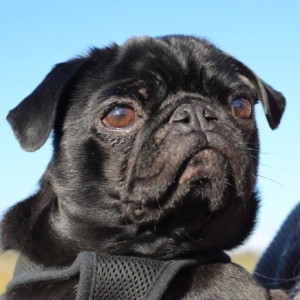 Noel explained that, due to the anaesthetic risk, they would not be in a position to do a long and complex operation on Buster until his breathing was sorted out. 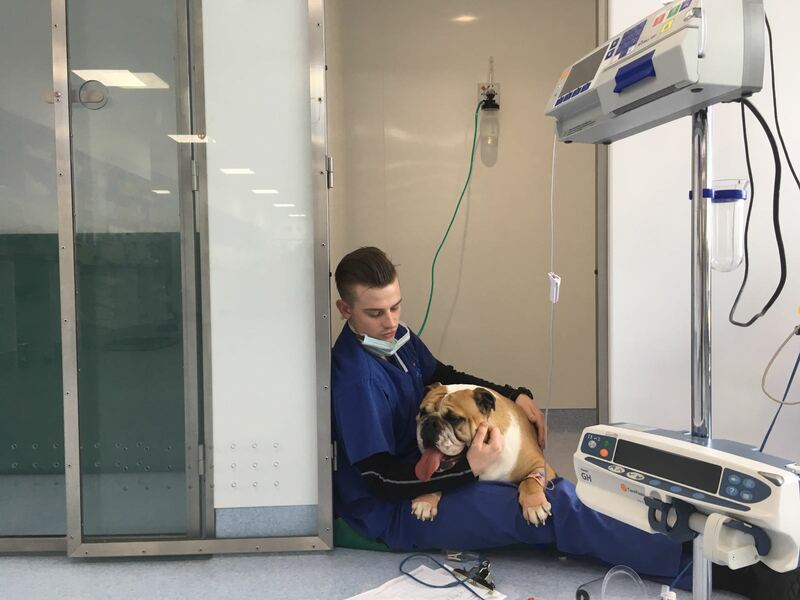 First stop for Buster was to visit Noel’s soft tissue hospital, where Dr Jonathan Bray would remove some of Buster’s soft palate, hopefully enabling him to breathe better and improve his chances of survival under future anaesthetics. The procedure went well, and after five months Kevin brought Buster back to Noel to have his total knee replacement that had been custom-made especially for him. Rachel was still waiting for her double lung transplant and was in hospital as her health had deteriorated, but she was eagerly waiting for Buster to get the treatment he needed. In surgery, Noel removed the diseased knee joint and replaced both parts by cementing in the implants at exactly the right angle. Both parts of the knee where then joined together to form the hinged joint. The procedure was challenging, but Noel was pleased with the final result so he was able to call Rachel from her hospital bed and let her know the good news. Five days later, Buster was ready to go home to continue his recovery and Rachel, having been discharged from hospital herself, came to pick him up. The pair got ready to convalesce together. Seven weeks after surgery Buster returned to Noel to check up on how he was doing. Kevin and Rachel were very pleased with his progress, noticing how much happier he was. Unfortunately, Rachel was not doing so well, and was becoming weaker. Although the original plan for Buster was to operate on both knees, Noel was keen to avoid further surgery, and stressed that he needed to lose more weight. If Buster was able to lose some weight, Noel was sure they’d be able to manage his remaining knee and hip problems medically, and avoid surgery altogether. He signed Buster off and Rachel was very pleased that he was well on the road to recovery. Sadly Rachel lost her battle and passed away four months later. Buster continues to improve and Kevin is determined to ensure he progresses and gets healthier, because it is what Rachel wanted. She adored Buster and only wanted the best for him.